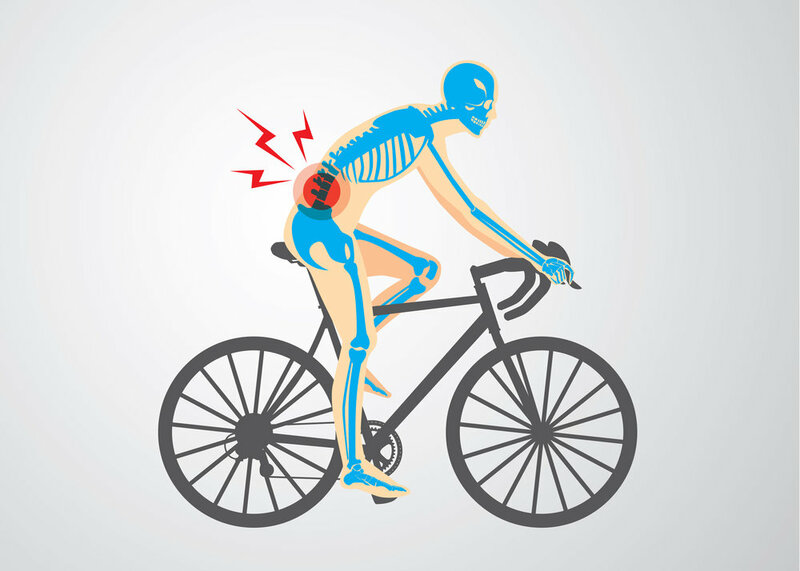 Why Does My Back Hurt When I'm Cycling? As well as tan lines and inside-leg chain ring imprints, there is something less welcome which many cyclists have in common. Though it’s frequently thought that knee pain is the main culprit, back pain is in fact the biggest cause of complaint amongst cyclists spending long periods in the saddle. In one study, out of 116 cyclists who had suffered some kind of overuse injury in the past 12 months, 58% had experienced lower back pain. So why is it so prevalent in such a low-impact sport? The chances are, the cause of the pain is not limited to any one thing, but a combination of factors which may or may not be correlated. Blame is commonly placed on the little-known psoas muscle. Originating in the low back, it travels through the pelvis and attaches to the thigh bone and is responsible for pulling the leg towards the chest. Given that this is the position that cyclists find themselves in for long periods of time with the muscle in a shortened state, it’s no surprise, then, that the muscle adaptively shortens, causing the back to arch as the muscle pulls on the spine, causing pain, weakness and muscle imbalances. This is increased risk in riders who spend long periods sitting during the day, and whose psoas may be in an already shortened state. Counteract this by stretching the psoas, particularly after a long ride. 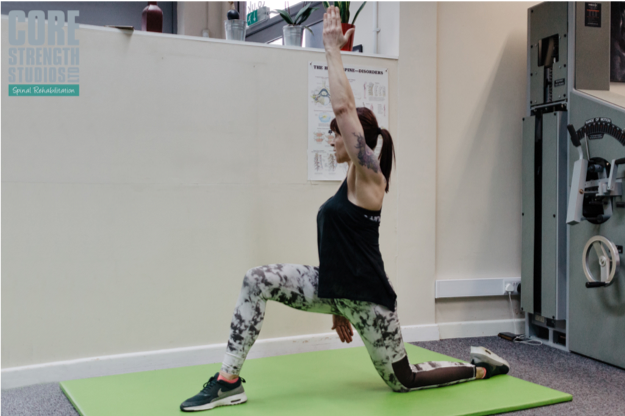 Kneeling down (see below), put one leg in front of the other, foot on the floor and push your hips forwards until you feel the stretch at the front of your hip (keeping your back straight). Increase the stretch by raising the arm on the same side as your back leg and bending and twisting to the side. Repeat on the other side. Deep tissue or sports massage on the psoas and low back can also help to release the muscle and ease any tightness. One of the jobs of the deep core and back muscles are to stabilise the pelvis and back. For cyclists, this means transmitting energy from the trunk down to the pedals without compromising the stability of the spine or pelvis. When the core is weak, however, this increased instability places additional strain on the back, intensifying the risk of pain, as well as more sinister problems such as slipped discs. During a ride, the muscles in your legs fatigue. As they tire, your postural muscles may be forced to compensate by taking on additional load. If they are already tired from keeping your position throughout the ride, this additional strain can cause your back to ache. By performing some simple core strength exercises a couple of times a week, you’re protecting yourself against weakness-related pain and giving your muscles a better chance to support your body and prevent back pain. Book a complimentary consultation with a back pain specialist in our Bristol studio to assess your pain, diagnose why your back hurts when you’re cycling and learn how to prevent pain long-term. To register, complete your details below and we’ll be in touch to book your session. Thank you! Look out for our call or email - we’ll be in touch within 24 hours.